Good news for Vitamin D-deprived cube jockeys! Your dreams of sustainably generating your own power without setting foot outside might come true with the CubeTube, an indoor photovoltaic electricity generator that grabs the energy beaming down from the buzzing fluorescent lights above to power computer workstations. 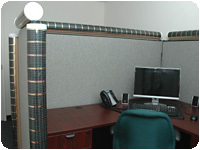 The device easily clips on to cubicle walls, desktops, and windowsills. Its cylindrical shape allows it to use light coming from all directions–not just overhead. Workers can plug in electrical devices to the CubeTube’s base, and if the device runs out of power, the system automatically switches the regular power grid. install, and will quickly pay for itself in electrical savings.” That all sounds great, but parent company Solaroad Technologies has yet to release a price for the CubeTube. And since ambient light doesn’t produce much power, it’s doubtful that the device could pay for itself in a reasonable amount of time. We’ll find out when the device is released next year, but in the meantime, check out Solaroad’s ElectraWall. The outdoor CubeTube-like device seems much more feasible, and it’s already in testing at Towson University. Then again, that would mean going outside.